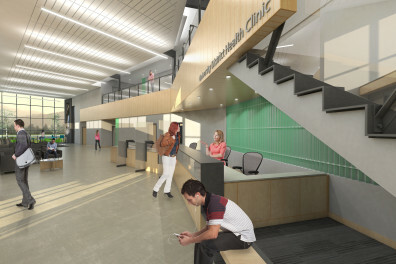 With their vision of true inter-professional education in mind, teaching faculty from medicine, nursing and pharmacy are spending many hours together designing the interior spaces and work flow plan for the soon-to-be-built University District Health Clinic. They envision a patient entering the clinic with the possibility of being seen by a physician, nurse, pharmacist or a combination all in one appointment—and even meeting with a physical therapist, social worker or occupational therapist on the spot if that is necessary. The clinic itself was born of a collaboration between WSU, Providence Health Care and Empire Health Foundation when leaders of those organizations realized a teaching health center would qualify for new federal funding for more doctor residency positions in Spokane. All newly graduated physicians must spend at least three years in a residency, also known as graduate medical education. The three groups formed a consortium to oversee most medical residencies in Spokane and almost immediately received federal funding for six more residencies, raising the number from 74 to 80. The goal is to reach 125 slots for Spokane. Currently, there are 1,600 residencies in Washington state, and only 110 of those are in central and eastern Washington. The consortium is advocating in Congress for the re-appropriation of federal funds for these residencies this year, Couture said. Meanwhile, the clinic is a little larger than it might be because every place there is a chair for a professional health worker there is another chair for a student to sit beside them, said Cindy Fitzgerald, Ph.D., director of the Doctor of Nursing Practice program at WSU Spokane. “Nursing has been built into the clinic as a full and equal partner,” Fitzgerald said. The nurse practitioners and their students will be involved in providing care, and the registered nurses and nursing students will perform the duties typically handled by the nurses in a clinic. They also could play the new role of “patient-care navigator” for those patients who would benefit by having a nurse assigned to them to explain in more detail the health care plan designed for them. The idea behind patient-care navigators is that patients will benefit from better care coordination because fear and misconception can slow down the healing process, Fitzgerald explained. “I have researched this and believe no other clinic in the country has so many different disciplines together,” Couture said. The medical residents, nurses, pharmacists and students will work together on the first floor of the clinic, while Eastern Washington University students in physical therapy, social work and occupational therapy will be on the second floor. The new clinic is expected to have 48 medical residents, most of them currently located in the family medicine and internal medicine clinics in the Fifth and Browne Medical Building, which will move to the new teaching clinic in the late spring of 2016. The two clinics served 35,000 low-income patients last year and the new clinic is expected to serve a similar population. Although most of the medical residencies are in family or internal medicine, there will be three in psychiatry, and there also is a one-year sports medicine fellowship for residents in the family medicine track. Fundraising is under way for this two-story, 42,000-square-foot teaching health clinic to be built on the southeast edge of the WSU Spokane campus. WSU is financing the construction through the sale of up to $16.25 million in general revenue bonds, but we have naming opportunities for many of our spaces and many other ways you can help. Contact Nancy Fike at 358-7616 or nancy.fike@wsu.edu. 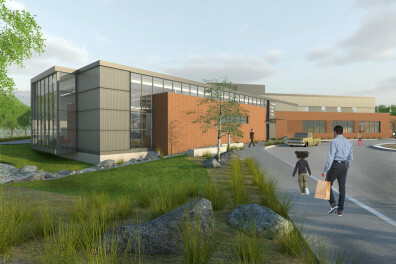 Groundbreaking is at 9 a.m. east of The Bookie, 412 E. Spokane Falls Blvd.